I was lucky enough to steal some time with the much sought-after creator of Punk Rock Jesus Sean Murphy at the 2013 Thought Bubble convention – anyone attending will have seen how long and constant his queue was! We talked about his art inspirations, the messages behind Punk Rock Jesus and the benefits of creator-owned work. JM: How would you describe your style of art, the themes that have influenced the way you work? SGM: I’ve pretty much taken what I like about manga and about European illustration artists and mixed them together. I think when Americans see my stuff they think “Oh, where did this come from?” Really I’m just delivering my favourite styles that I’ve seen, in South America, Japan and Europe. JM: What were your influences for Punk Rock Jesus? I’ve read that you were inspired by the 2008 elections, and the worry about Sarah Palin getting into office. SGM: Yeah, that’s pretty scary! And how it looks to the outside world, I can’t imagine. Gun control…she’s really scary. A lot of comics don’t really tread on that ground, and I think it’s a shame that they don’t push the boundaries more. The superhero stuff is great, you know it holds up 80% of our industry, but that’s not the stuff that I always wanted to draw, so I thought that Punk Rock would be a way to address some of the political issues, but also be a good excuse to do a sci-fi story with some action. I think the trick was to give people enough medicine with enough entertainment as well. JM: Most writers will agree that it’s preferable to create their own work rather than work on existing superheroes, but do you prefer working with someone like on Punk Rock Jesus or collaboratively with someone like Scott Snyder on The Wake? SGM:I like to do both. Doing Punk Rock was great, but it was very exhausting because I had to do everything myself. It’s nice to switch off, just get a script and not have to think about where the story’s going and just be in charge of art duties. So I imagine I’ll be going back and forth through my career. JM: Is there a classic figure you’d like to put your own spin on though? SGM: I like doing my own stuff, the way Image is going right now and the way Kickstarter’s working…there isn’t money if I did Batman or Punisher or something cause Marvel can’t pay what Fiona Staples makes working on Saga for example, or what East and West is making. It would be nice to step in and do Punisher or Wolverine or something one day. I’m not sure; I’m sure there will be excuses to do that in the future, but right now probably not. JM: There was talk a while ago of a movie of your comic Off Road, do you think that’s something that might still happen? SGM: I don’t know, I don’t think so. I heard that Mandalay were looking at it. But sometimes movie companies look at books and they don’t tell you if they’ve passed on it, you just never hear about it, so it is what it is. JM: There were also rumours about you doing a sequel to Outer Orbit, something a bit more silly. SGM: No, I wouldn’t do a sequel. That was one of the books that was fun to do, me and my partner at the time had a great time – Zach Howard – but I don’t think it’s in the future any more. It was a fun little space romp but nobody really needs it, I get very few copies to sign and I don’t hear about it very much. Zach seemed to think that people were very interested in it but I never really got that impression. JM: You’ve done some work for Nike and Land Rover – are those jobs you took just for the money, or because you really wanted to do it? JM: So you wouldn’t want to do it again? SGM: I would. I mean, I didn’t go after those jobs, they just rang me up and said “would you like to do it?” and I said sure, it paid the bills. I’m sure I was pretty desperate for money at the time, but…the Land Rover one was fairly hassle free, the Nike one as well. Not all those jobs are like that, sometimes there’s a lot of overbearing people that you have to please. I had to do a job for Activision once, it was a nightmare. If I ever do video game stuff again, I want to make sure that I won’t have that kind of interference. I actually got offered to design characters for Assassin’s Creed III, and it was one of those jobs that I was so disappointed I couldn’t take it, because I was doing Punk Rock Jesus and had made other commitments. Still, whenever I see a poster or advertisement for Assassin’s Creed I’m like “aagh!”, like you’ve fallen on your keys, like I wish I could have done that! JM: If you could do anything, what would you do? SGM: There’s a point where I’d like to step out of comics and develop an indie game, I don’t know how. If I had proper capital, if I can Kickstart it, bring my name to the project and get it moving and do like a 16 bit retro style game you could download, I think I’d do that. JM: You’re a little over half way through The Wake now in terms of release. Are you happy with how that’s going? Do you have plans for any other projects coming up? SGM: Yeah I’m thrilled, I’ve never been on a book that has killer sales like this. I’ve had stuff that’s sold okay, and stuff that’s got reviewed well, but never really brought in the dollars. I’ve just finished twelve pages of Batman with Scott, which will be out on the 27th January, and I should be finished with The Wake in nearly April. After that I might think about going to Image for some creator-own work, maybe work with Mark Millar or something like that. Check out my review of Punk Rock Jesus, and Alasdair’s review of The Wake, and of course Sean Gordon Murphy’s website. 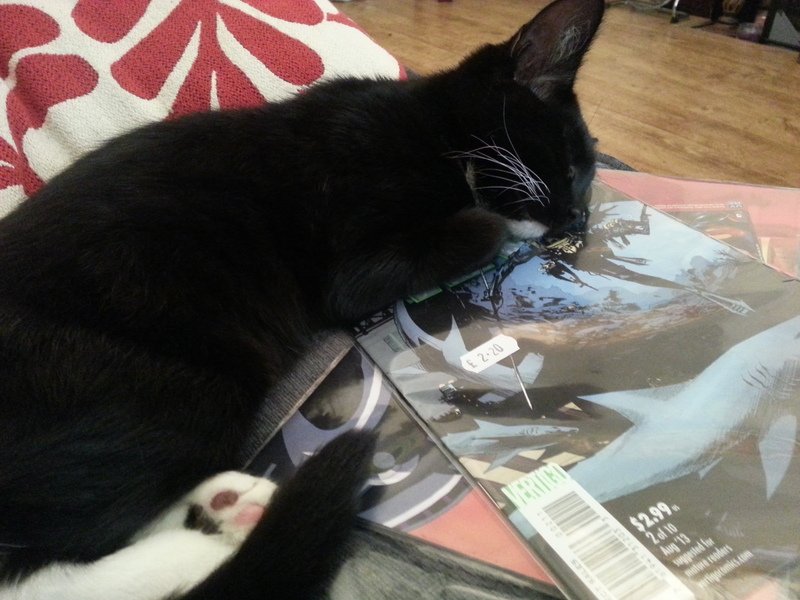 As an added bonus, here’s a picture of my cat sleeping on Sean Gordon Murphy and Scott Snyder’s The Wake. Aaw.